You know when you choose a new knitting book off the bookshelf at the book store and you actually giggle out-loud at the cuteness of the patterns? Yeah... that's what happened to me when I opened my copy of 25 Stylish Knitted Slippers: fun designs for clogs, moccasins, boots, animal slippers, loafers & more by Rae Blackledge. Not even kidding! I immediately held it up to show the Hubbs page 45, the Moccasins pattern (see below), and did a little happy dance in my seat. Here's the rundown on this perfect-for-the-holidays book! Right from the get-go, Rae hits the nail on the head with something I wanted to learn more about: felting! 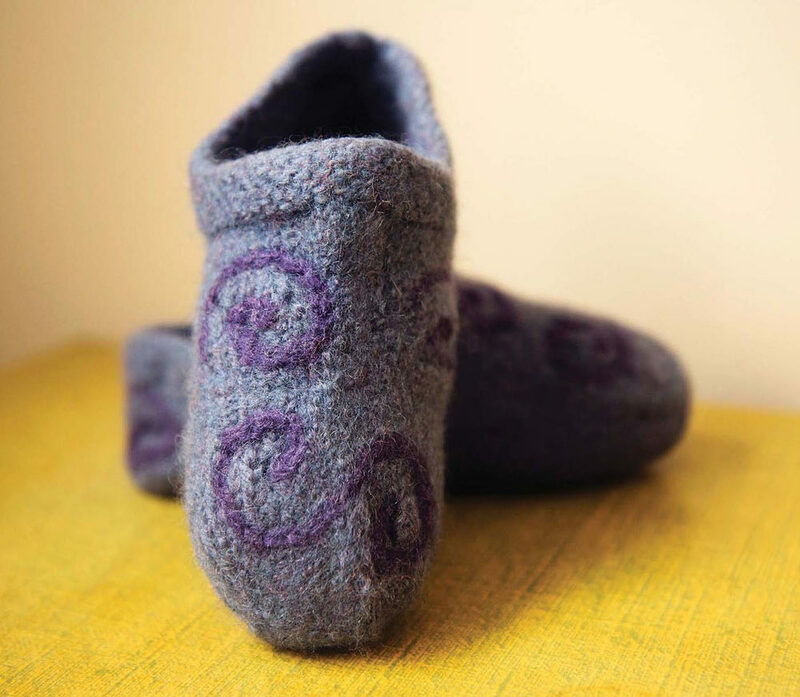 She has 4 patterns for felted slippers, from basic two-color slippers to an absolutely adorable spiral clog. And the best part? She tells you the before and AFTER gauge of the felting. Now... how you are able to read gauge on felted items is beyond me, but it gives you an idea how much the project will shrink so you can actually make something that fits. Pretty genius! 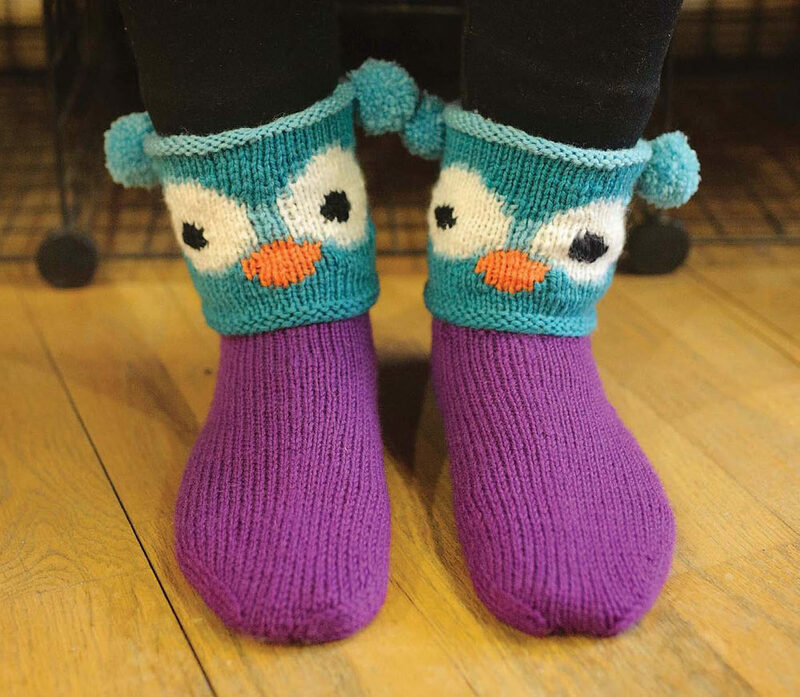 The next chapter of the book, Fun and Fantasy Slippers, focuses on totally kid-friendly designs, including Owls, a Stegusaurus tail, and Elf slippers. Oh, who am I kidding? I totally want the Elf slippers. They're called "Elfkin" and I'm pretty sure I need a pair of these in my life. There's even Cowboy boots, Foxes And little bunnies named for Beatrix Potter. So so so cute. Not to quibble with this author but we have a different idea of "everyday" slippers, me thinks! The patterns in this third section are beautiful. Not subjectively. Categorically. The Tilted Espadrilles actually made me gasp at how cute they are. We've already talked about how I feel about the Moccasins. And I can't ignore the Caramel Twist. 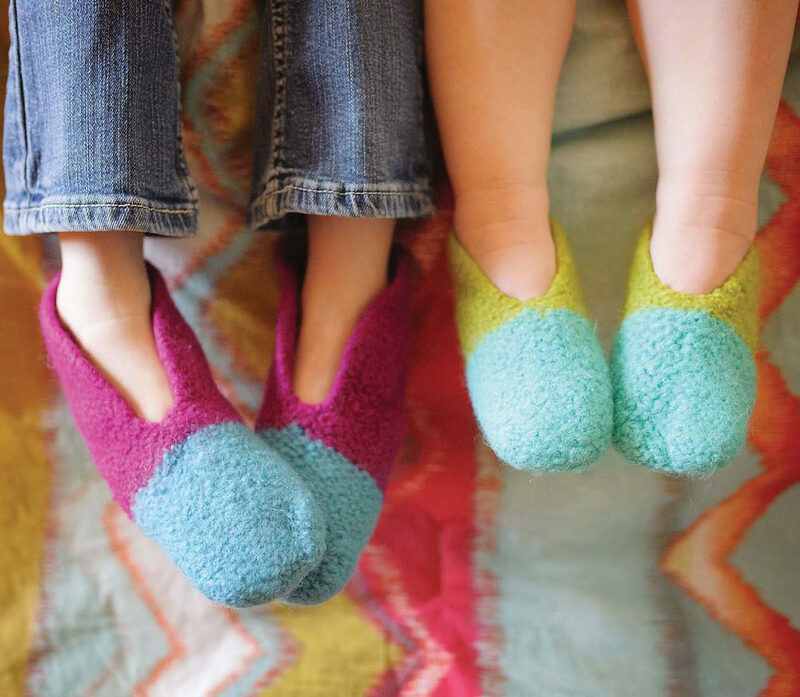 There are some unbelievably delicate slippers, some zany Color Study Slipper Socks knit in DK that would knit up super fast and even some ballet-slipper style that include lace up ribbons. Yep - she has a section for us, too! I love boots. I actually think I have a rather unhealthy love of boots. I only own a few pairs because it's HOT here in SoCal but whenever it's cold enough to wear boots I instantly feel like a rock star. Now imagine if I got to wear knitted boots to keep my feeties warm on my hardwood floors? Oh my! I'd be strutting all day long. My favorite have got to be the Cabled Cappuccino boots. They're quite simple but the perfection of the simplicity just works. The Hibernation Boots are adorable for adults and kids alike and look like they could actually be worn outside. Attach a rubber sole to these and I'm pretty sure they could be. *mental note: get rubber soles for boots*. And the last one in this section that slays me are the Kaleidoscope Knee Highs. While teeeeeeechnically not boots but rather knee high socks (in my very humble opinion) they're absolutely gorgeous and would be stunning with tights and high boots overtop. This is actually the title of the final section of the book. Rae has provided a great resource section on Yarn (weights), Gauge, Sizing (children's through adults), how to read charts and how to add SOLES to your SLIPPERS!!! She also has a wonderful photo tutorial in the back of the book showing steps of working short rows, how to work i-cords, and how to work intarsia colorwork. It's a pretty complete book and I can't wait to cast-on some new foot-warming projects! To get your very own copy of the book, visit Stackpole Books and order a hard copy of the book (it's a soft-cover book) or, go all high-tech and order an E-book. VERY cool! 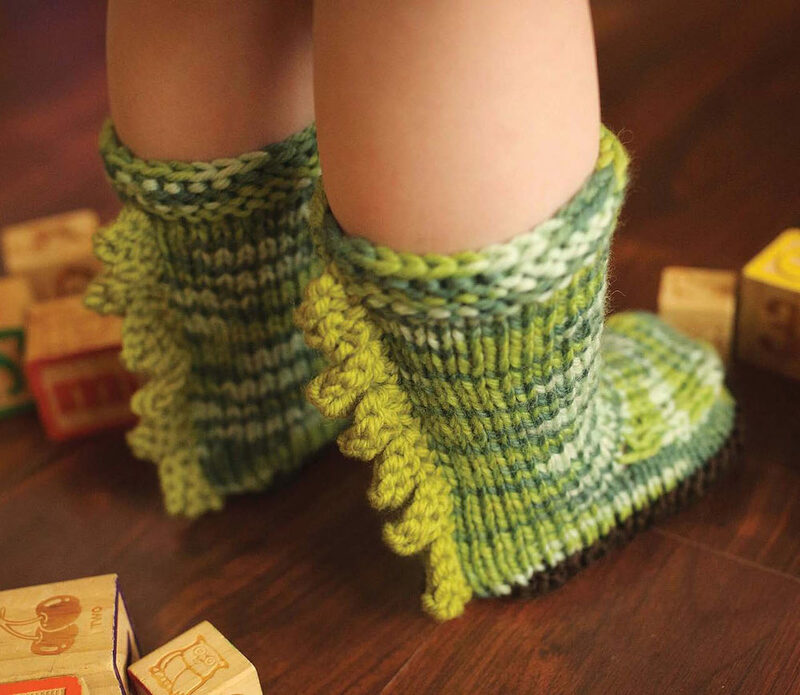 I received a copy of 25 Stylish Knitted Slippers by Rae Bleckledge, from Stackpole Books, free of charge, in exchange for an honest review of the books content. The wording and opinions above are my own.